National Volunteer Week Spotlight – Friday Finale! The week is ending (at least the business week) and we wanted to go out on this fabulous (FLASHBACK) Friday with a community focused campaign that merges some of our favorites things – people, our corporate partners, community and doing good. 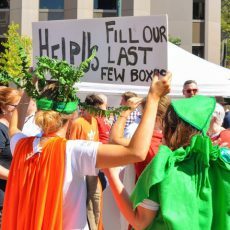 Volunteers in today’s spotlight participated in our annual United We CAN Kick-Off Food Drive and Sculpture Contest September 14 2018 for Wayside Food Programs in Monument Square. Enough food was collected for 28,163 meals, making the event the largest one-day food drive in Cumberland County history. Food from the event was then distributed to 55 partner agencies throughout Cumberland County and made a huge impact for neighbors that rely on these critical resources. The need for food and basic resources is vast in our region and state. 1-in-3 school age children in Cumberland County are eligible for free of subsidized lunch, indicating that families are struggling to meet basic needs and 62% of SNAP (Federal Supplemental Nutrition Assistance Program) participants are in families with children. FMI about SNAP visit unitedwaygp.org/advocate/. The United We CAN Kick-Off Food Drive helps to leverage the caring power of our community to fulfill a great need in Greater Portland communities.This year we hope to break the record again, and raise enough food for 30,000 meals!